All wedding services to make your wedding day run smoothly - from cleaning, to set up, to valet parking and everything in between.Putting on a big event like a wedding is not just about the aesthetics; it is about being responsible for the equipment, venue and people involved. All this requires various services to protect yourselves from possible problems on the day or, in worse case scenarios, legal blowback. From arranging the cleaning of the premises after the event, the cleaning of your wedding gown to working out what you are liable for, service providers can help you navigate the logistics of carrying the can for such a massive event. Weddings can be glorious, fun festivals of joy but -like any festival organizer knows - the joy and bliss is only really certain when accidents don't happen, squabbles don't break out and the parking is easy. Employing the services of insurance companies, security services and valet parking is not so much an extravagance as a necessity if you have a large wedding party. Valet parking services often give discounts for big events and certainly will make your guests feel much safer about leaving their cars for such a long period of time. Good valet parking services are used to watching over corporate events and having folk come and go. It is a way of showing that you care about the well-being of your guests and their property and appreciate their presence. Event insurance is likewise a way of protecting both yourselves as bride and groom, the venue and your guests from disasters, minor accidents and problems. It is often a requirement of most venues and certainly a necessity if you are planning on guests of various degrees of mobility, dancing long into the night after a few hours of drinking. Security services may seem over-the-top but they can stop you from being on edge on the day, wondering whether some argument will break out or the famous band you hired is going to lead to your party being gate-crashed by fans. 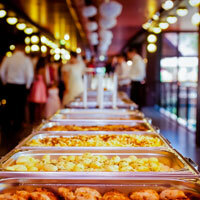 Professional services are discreet and used to dealing with big corporate events - you are in safe hands.